The primary function of the respiratory system is to supply the blood with oxygen in order for the blood to deliver this oxygen to the body, and to eliminate carbon dioxide. The respiratory system does this through breathing. Breathing is the process of getting oxygen into the lungs and carbon dioxide out of the lungs. It allows for gas exchange to take place so that oxygen can be absorbed from the lungs into the blood and carbon dioxide is removed from the blood and exhaled from the lungs. Breathing should not be confused with respiration. Respiration is the release of energy from the break-down of glucose in living cells. The intercostal muscles found between the ribs contract. The diaphragm contracts and flattens, pulling downwards. The result is that the thorax increases in volume, which in turn lowers the pressure and consequently air is sucked into the lungs. Exhalation (also known as expiration – but only really in medical terms, in normal English expire means die, so be careful!) – This is breathing air out of our body. This lowers the ribs downwards and inwards. The diaphragm relaxes, moving back upwards. The result is that the thorax decreases in volume, which in turn increases the pressure inside it and consequently forces air out of the lungs. Firstly, oxygen enters the body through the mouth and the nose. This oxygen then passes to the pharynx (throat), then to the larynx (voice box) and enters the trachea; a tube that enters the chest cavity. In the chest cavity, the trachea splits into two smaller tubes called the left and right bronchus (plural-bronchi). Each bronchus then divides many times into smaller branches called bronchioles. Each bronchiole finally leads to a bunch of tiny air sacs called alveoli. Alveoli inflate during inhalation and deflate during exhalation. The average adult's lungs contain about 600 million of these spongy, air-filled sacs that are surrounded by capillaries. ​ It is at the alveoli where gas exchange takes place. The walls of the alveoli are surrounded by a network of blood capillaries. 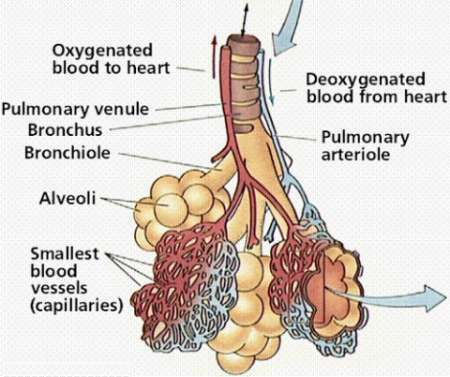 In fact the alveoli walls share a membrane with the capillaries which allows for oxygen to diffuse through the alveoli wall and enter the bloodstream and then travel to the heart. At the same time it allows for carbon dioxide to diffuse from the bloodstream into the alveoli and exhaled out of the body. Both oxygen and carbon dioxide move from areas of high concentration to areas of lower concentration. 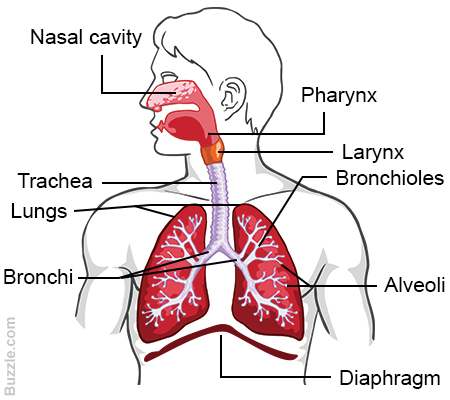 1.- Draw and label the respiratory system. 2.- What is the function of the diaphragm? 3.- What is the main function or purpose of the respiratory system? 4.- Are breathing and respiration interchangeable? 5.- Where does gas exchange take place? 6.- Explain how gas exchange takes place. Include a scheme or drawing. 7.- What is the transport system by which gas exchange takes place?